The latest architecture and design news for Nicholas Szczepaniak Architects London. 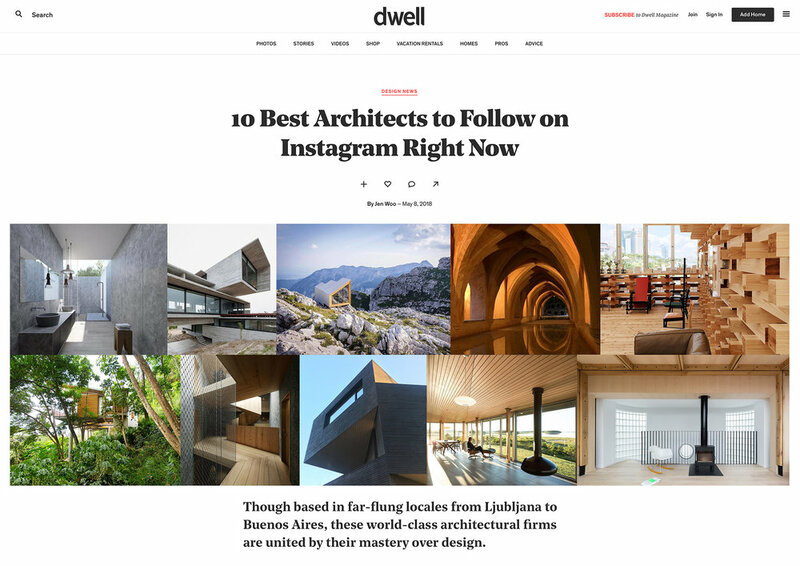 Thank you to dwell for naming us as one of your '10 Best Architects to Follow on Instagram Right Now' list! Read their kind words here. We are extremely proud to announce that we were awarded the RIBA Regent Street Windows Competition 2018 Highly Commended Best Collaboration Award for our shop front window display for L'Occitane. Nicholas Szczepaniak Architects have collaborated with McCaul Goldsmiths as part of Clerkenwell Design Week 2018 to design their shop front window display which explores a dialogue between the light reflecting qualities of McCaul's jewellery and the enigmatic quality of darkness. We're delighted to announce that over the last few months we've been collaborating with L'Occitane as part of the RIBA Regent Street Windows Competition 2018. Inspired by the magical Golden Hour of Provence, the installation explores the sensorial relationship between light and smell. Over 2000 Fresnel and Plano-Convex lenses are suspended in space to form a delicate veil that refracts and converges light whilst scent diffusers emit L’Occitane’s fragrance ‘Terre de Lumière’ to create an immersive and interactive experience. Click here to head over to the Regent Street website to cast your vote for your favourite window and be in the chance to win a £100 gift card! We're so happy to announce that our Union Wharf project has been shortlisted for the Architect's Journal Small Projects 2018 Award showcasing the best small projects completed in the past year. Check out the full shortlist here. Union Wharf is featured in Wallpaper* magazine today. Please click here to read the full article. We're delighted to announce that Union Wharf has been selected as one of London’s best home extensions in Don't Move, Improve! 2018. Find out more in the magazine and free exhibition, opening 25th Jan 2018 at New London Architecture. To see finished images of the project please click here. Merry Christmas from Nicholas Szczepaniak Architects! Christmas material study using plaster of paris ceramic mixed with green and black dying pigments to create a bespoke coaster set. 2 part plaster paris/1 part water/and a partridge in a Fraser fir tree. Nicholas Szczepaniak Architects' Christmas trip to Verona and Venice where we explored the wonderful and intricate works of Carlo Scarpa. Nicholas Szczepaniak Architects have been appointed to design a boutique hotel on a coastal site near Essaouira in Morocco. Concept design studies are underway. Andrei-Ciprian Cojocaru from Nicholas's undergraduate studio Unit 5 at University of Greenwich has been awarded the SOM award for best design project at the RIBA Presidents Medals 2017. See his project here. Our Stonenest Street project in Islington has been submitted for Planning. Union Wharf reaches Practical Completion. See images of the finished project here. Nicholas travels to Dubai for the launch event of Chaps & Co, d3. Our Goswell Road Office facade and entrance has completed on site. Chaps & Co D3 opens to the public. See the final images of the project here. The sliding doors being crane-lifted onto the roof terrace of Union Wharf ready for installation. Nicholas and Ying are in Dubai for snagging with the contractor for Chaps & Co D3. Zac Higson has joined our team. Zac has recently completed his Undergraduate degree at the University of Greenwich where he received First Class honours. For his final third year project shown above, entitled Electric Soho, Zac designed a theatre with experimental building fabric which recreated the light quality of Soho in the 1960’s and 70’s. Chaps & Co D3 features in Esquire magazine. See the article online here. Nicholas is in Dubai inspecting the joinery prior to assembly on site at the new flagship Chaps & Co store at the Dubai Design District. The Chaps & Co flagship store at the Dubai Design District starts on site. Leverton Place, Camden site visit. The project includes a 3 storey bespoke stair fabricated from steel inspired by La Maison de Verre. Nicholas's University of Greenwich Design Unit 05 heads to Holland to visit Rotterdam and Amsterdam for a study trip. Highlights include a tour of Rotterdam's trading port. Nicholas Szczepaniak Architects head to Dubai for the opening event for the second Chaps & Co store at the Dubai Marina. See the finished images of the project here. Goswell Road shower rooms have completed on site. See the final images of the project here. Arlo’s restaurant has completed on site and opens to the public today. Nicholas Szczepaniak Architects are delighted to have been appointed to design the flagship Chaps & Co store at the exciting Dubai Design District, d3. Our second store for the Chaps & Co Barbershop brand starts on site today at Dubai Marina. We have moved into our new studio in Soho! Cattle & Co, King's Cross has reached Practical Completion and will be opening to the public soon. Nicholas presents the work of the practice at the RIBA CLAWSA event at University of Westminster. Chaps & Co JLT opens to the public. To see images of the completed project, please click here. Nicholas Szczepaniak Architects have been shortlisted to the final 6 out of 120 entrants to design 120 Beach Huts on the promenade of Milford on Sea. Nicholas Szczepaniak has been appointed as Unit Design Master of Unit 05, University of Greenwich. Nicholas Szczepaniak Architects have been appointed to design a new commercial shower facility for a major new office development in Clerkenwell. Nicholas Szczepaniak Architects have been appointed for the full refurbishment and reconfiguration of a 3 storey Kentish Town mews property. Bassett Road Flat refurbishment and reconfiguration reaches Practical Completion. Nicholas Szczepaniak Architects have been appointed to undertake a feasibility study to refurbish the front of house areas of Northburgh House in Clerkenwell. Southwark House phase 1 commences on site. University of Greenwich Architecture Department End of Year show opens to the public. Nicholas Szczepaniak Architects moves into their first office in Fitzrovia London. Nicholas Szczepaniak Architects have been appointed to design the maiden store of Chaps & Co Barbershop in Dubai. Studio trip to Tate and Lyle Factory in Essex. New Venice exhibited at the Art meets Architecture exhibition in Glasgow.